Click on the images above and below to read the text of the article. 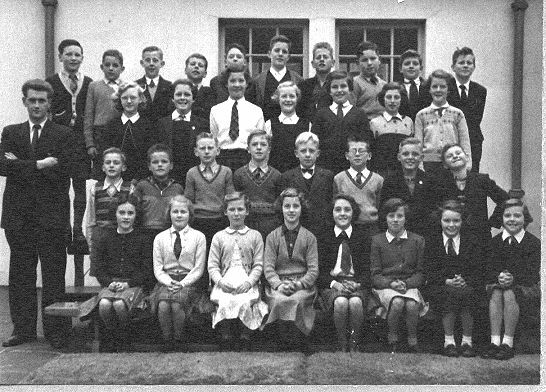 Cairn School, Primary 7 around 1956-57. Contributed by Heather Wotherspoon. Front Row Gwen Pollock, Betty McIlwraith, Sylvia King, unknown, Anne Garry, Brenda Milby, Margaret Dorans, Jean Anderson. Back Row - Billy Kilpatrick, John Thomson, Peter(Gilbert) McCrindle, Archie Jamieson, Andrew McDowall, Neil Wotherspoon, Robert McCulloch, Scott Latimer, Gerald Anderson, Jim Galloway. Teacher- Billy McCreath from Girvan now living in New Jersey, USA. His cup runneth over. The Montclair Art Museum has opened a new wing, and commemorating the event are ceramic mugs designed by William McCreath of Fine Arts. McCreath has had several of his creations, including a variety of plates, bowls and sculptures, sold in the Museum Store. So when it came time for a special piece to commemorate the museum's new wing, Ellen Rosenberg, the store's merchandise manager (pictured with McCreath), asked him if he'd be interested. He saw it as another opportunity to express himself as an artist. Using porcelain clay, McCreath created three designs in jade, bronze and purple, which coincide with the museum's earth-tone colors. "I created designs that have impressions that allow the fingers to fit into the cups as a sort of handle," he said. His creations were exactly what the museum was seeking. "We were looking for something that had texture and would be comfortable to hold," said Rhonda Sturtz of the Museum Store. "We also wanted the design to have a Native American look to it." For the rest of the story at Montclair State University website click here.